The Librarian of Congress announced that Grammy and Academy-Award-winning songwriters Burt Bacharach and Hal David will join the ranks of Paul Simon, Stevie Wonder, and Paul McCartney as recipients of the Library of Congress Gershwin Prize for Popular Song. Bacharach and David each will receive the Library’s Gershwin Medal next spring at an all-star tribute in Washington D.C. This will be the fourth time the honor has been awarded and the first time to a songwriting team. 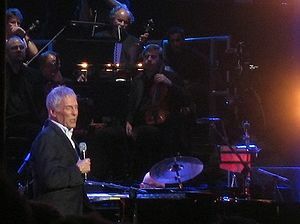 The creators of dozens of hits including "I Say A Little Prayer," "Do You Know the Way To San Jose?," "Raindrops Keep Falling on My Head," "Walk On By," "What the World Needs Now" and "Alfie," for artists such as Aretha Franklin, Dionne Warwick, Jackie DeShannon and Herb Alpert, composer Bacharach and lyricist David are the first songwriting team to be honored with the Gershwin Prize. "It's a great honor to receive this award and to follow the past recipients, Paul Simon, Stevie Wonder and Paul McCartney, it doesn't get any better than this," Bacharach, 83, said in a statement with Thursday's announcement. In the same statement, Librarian of Congress James H. Billington said, "Their creative talents have inspired songwriters for more than five decades, and their legacy is much in the tradition of George and Ira Gershwin, for whom this award is named." The first Bacharach-David song registered with the U.S. Copyright Office, which is part of the Library of Congress, was "Peggy in the Pantry," dated May 9, 1956. Since their heyday in the 1960s and '70s, Bacharach has teamed for varied projects with other musical partners including Elvis Costello, Don Was and Ronald Isley of the Isley Brothers.